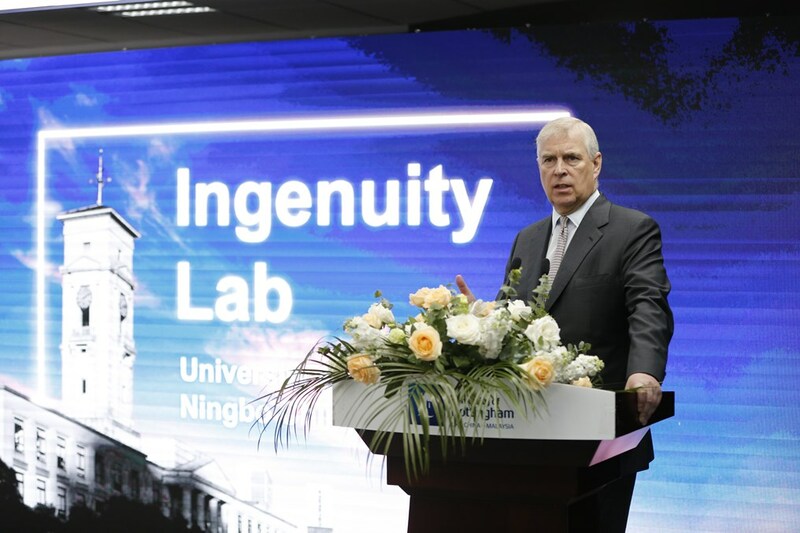 The Duke of York visited the University of Nottingham Ningbo China (UNNC) today (2 November 2018), opening the Ingenuity Lab. 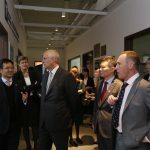 The Duke is in China on an official visit at the request of Her Majesty’s Government and will undertake a series of engagements in Shenzhen and Ningbo before attending the inaugural China International Import Expo (CIIE) on November 5th 2018. The Ingenuity Lab will be the innovation centre for UNNC students and alumni to explore their entrepreneurial ideas and establish their own businesses. It will provide a range of services and activities to create a start-up ecosystem for student entrepreneurship. 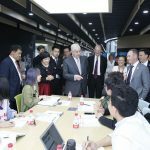 At the event, HRH also launched the Ingenuity Global Innovation and Entrepreneurship Competition, an innovative event led by UNNC, open to entrepreneurs from UK, China and India. It is designed to inspire entrepreneurial solutions at a global scale for start-ups, and to offer a networking opportunity with exposure to international investors, start-up peers and industry professionals. 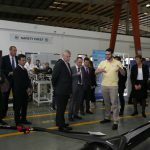 His Royal Highness, The Duke of York said: “Experiences at institutions such as the UNNC Ingenuity Lab will help students develop the process engineering to transform ideas to a commercial result. They will support you as you grow your dreams. Wishing you as much ingenuity as you can find”. The Duke was greeted by staff and students at the beautiful 144-acre garden campus and experienced the stimulating culture of innovation and entrepreneurship at UNNC. 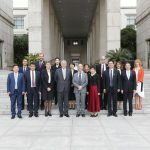 HRH attended a roundtable discussion with representatives of students and alumni about their experience and connection with UNNC, as a unique higher education destination in China especially when they tried to explore ideas or start their own enterprises. 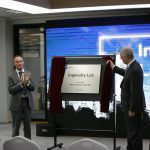 As part of the Ingenuity Lab Launch, The Duke then unveiled the plaque for this brand new innovation centre and announced the launch of the Ingenuity Global Innovation and Entrepreneurship Competition. 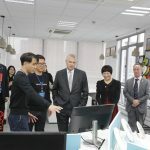 HRH also met with some of the company representatives at the Li Dak Sum Incubator. 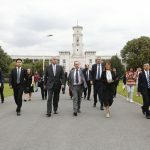 Two start-up founders who graduated from Pitch @Palace – a platform founded by The Duke in 2014 to amplify and accelerate the work of entrepreneurs – had the opportunity to present their recent business success since Pitch@Palace in Beijing. 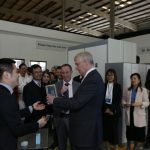 In addition, the two start-ups, Ningbo Yikun Sports and Innov8tia also demonstrated to HRH how UNNC’s support for their businesses have been critical to their success. Yikun Sports is a disc sport company that not only provides products, but also related services as sports promoter in China. Innov8tia is an environmental engineering company committed to addressing one of Ningbo’s largest environmental issues through an innovative sludge treatment technology. The two multi award-winning start-up companies are both founded by UNNC alumni. 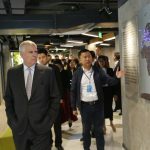 The visit also included a trip to UNNC’s New Materials Institute (NMI) at Ningbo’s High-tech Zone, where HRH saw at first-hand the university’s achievements on research and technology transfer. 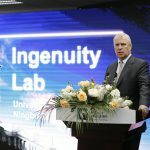 Since its establishment in 2015, the Institute has seen the University of Nottingham’s world-class research expertise on new materials come together with businesses and talent in Ningbo to tackle local challenges including healthcare, environment and transport, and support the growth of the economy. 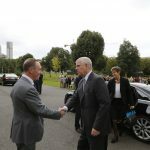 It has so far attracted several UK companies to invest.